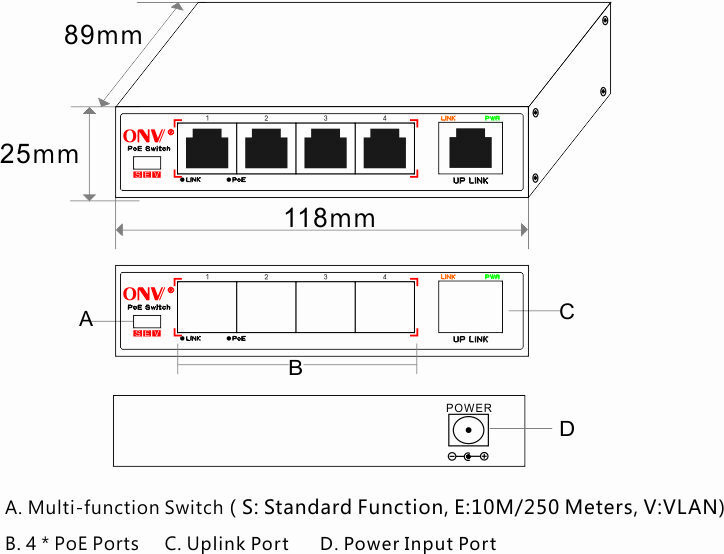 5-Port 10/100M Long Transmission Distance PoE Switch. 4 PoE ports, 10/100M. PoE standard IEEE802.3af/at. Max PoE power for each port is 30W. Total power is 110W. The transmission distance is 250 meters (10M). Support VLAN function. 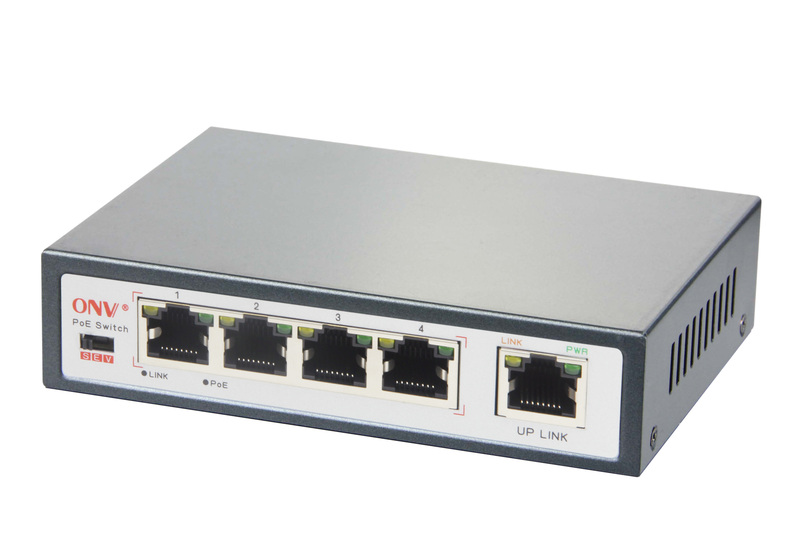 ◆5 * 10/100 Mbps auto-sensing RJ45 Ports, 1-4 port support PoE, meeting the standard of IEE802.3af/at. Max PoE power for each port is 30W. 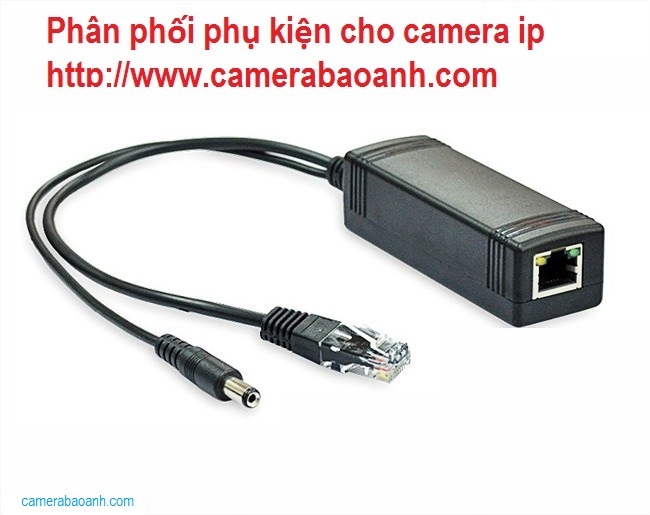 ◆Multi-function Switch: Long Transmission Distance Mode: 250 meters, Enable/Disable VLAN. 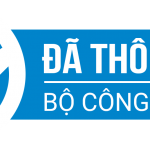 ◆Meeting standard of IEEE802.3 10Base-T and IEEE802.3u 100Base-TX. ◆Mini size and no-noise design. Could be installed on desk or wall. 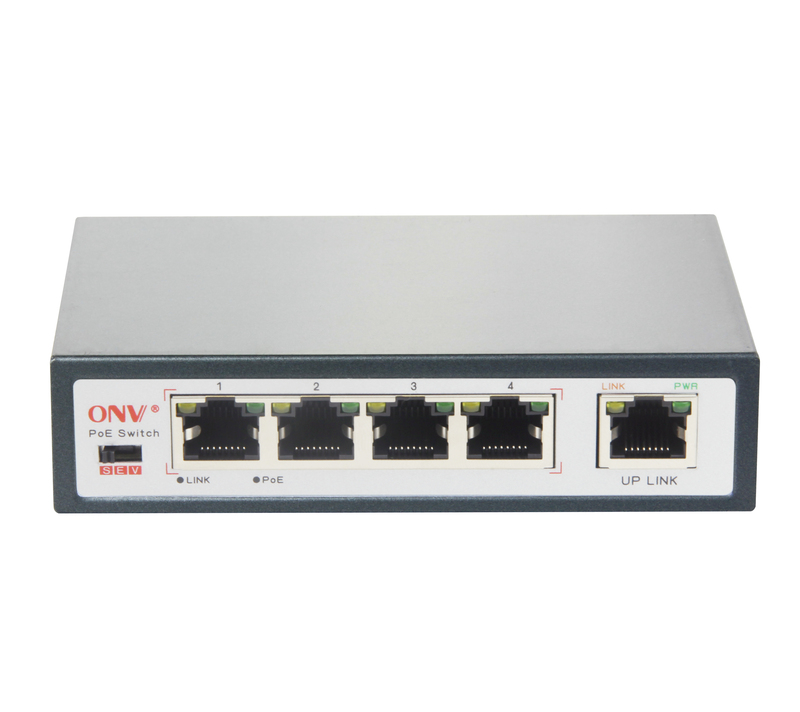 The ONV-POE31004PL-at switch provides power and data transmission from a network node through Cat.5e/6 cables. 5 ports could fast connect with 10/100Mbps, 4 ports among them could supply power at the standard of IEEE802.3af/at. With the auto-sensing function, it could supply power to PD device (IEEE802.3af/at standard). What’s more, if the PoE device disconnected, it would stop supplying power. 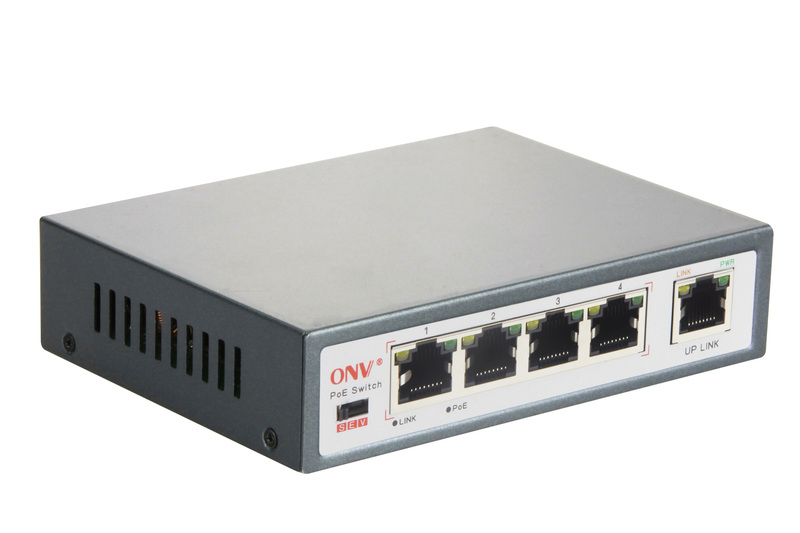 The switch features simple and reliable design, automatic identification of PoE supply voltage and power, speed, full duplex and AutoUplink cable type. With multi-function switch, it can be changed to long transmission distance mode, enable/disable VLAN. This cost-effective switch provides network layout which need to simplify wireless access point (AP) and IP-based surveillance network cameras to install in commercial network and home network. It is the ideal networking solution for work-groups and intelligent community fiber access.These devices away from electrical outlets are very suitable for hanging on the wall or ceiling. 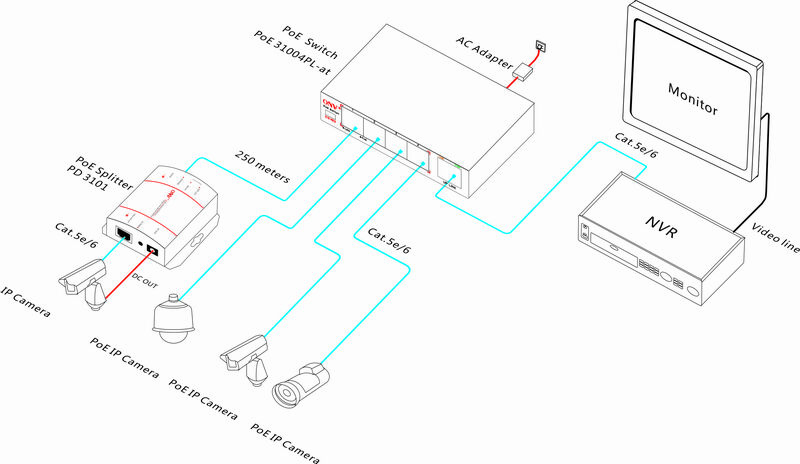 PoE eliminates the hassle for these devices, specially the electrical outlets. Connect the AC power connection to make those difficult device more flexible, and the installation cost minimization. 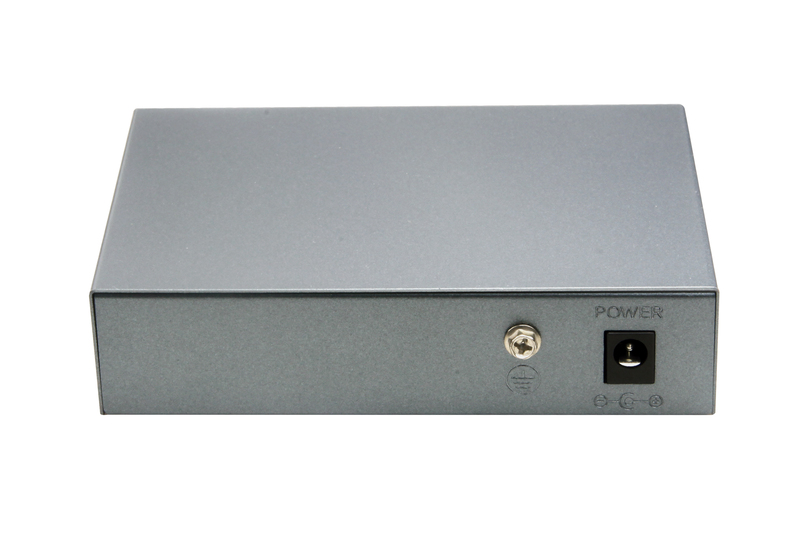 Description: 5-Port 10/100M Long Transmission Distance PoE Switch. 4 PoE ports, 10/100M. PoE standard IEEE802.3af/at. Max PoE power for each port is 30W. Total power is 110W. The transmission distance is 250 meters (10M). Support VLAN function.